The most comprehensive database of all 28,190 cities, towns and villages in Canada – with linked counties, provinces, postcode areas, coordinates and more. It is ideal for website development, location lookups and data verification. Updated for Spring 2019. Get clean, consistent and well-organized data in one single download, with no need for lookups or complex conversions. All 28,190 city and town records include linked location information (including county, province, postcode area, map reference, latitude-longitude, census division, area code and time zone). 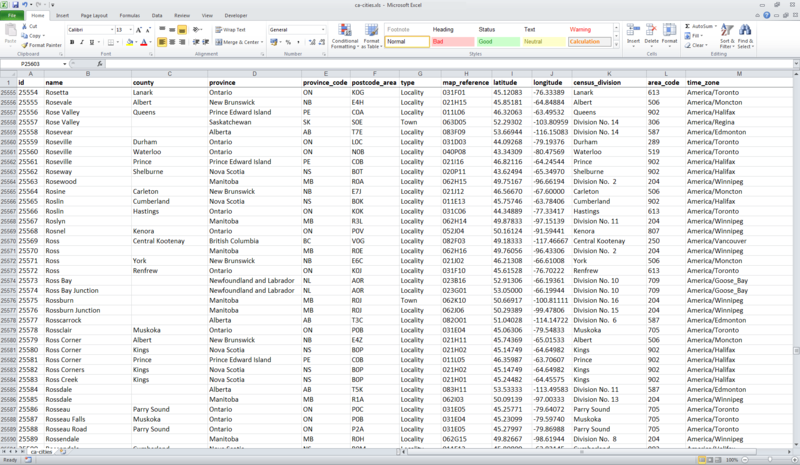 The data is compatible out-of-the-box with nearly all spreadsheet applications (including Excel), SQL databases, GIS systems and programming languages. This means you can use the data quickly and easily, without any time-consuming imports or file conversions. You can have complete confidence in the quality and accuracy of our data. All records have been updated for 2019 using the most recent data from the Canadian Geographical Names Board, Natural Resources Canada and Statistics Canada's Census Program. The last complete refresh was on the 6th April 2019 . 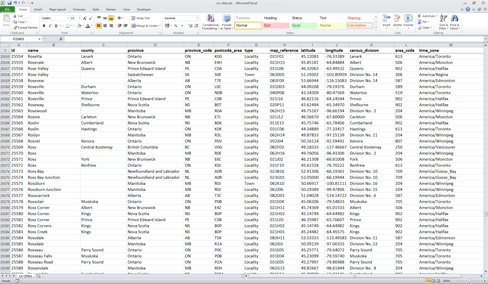 All populated places recognized by the Canadian Government are listed in the data, with no duplicates. It includes both incorporated places (cities, towns, villages and hamlets) plus smaller unincorporated populated places. Historical and abandoned settlements are not included. The list covers all 13 provinces and territories in Canada, with no gaps in the data. Yes. You're free to use the data for business and commercial purposes and without attribution. Please see the licencing terms and conditions for more information. Yes. With the annual subscription package you can download the list today, plus you'll receive complete updates every quarter for the next year. Hundreds of software development, marketing, engineering and logistics companies across Canada rely on our city list to help run their public and internal computer systems. It's frequently used for location searches, auto-fill functions, data verification and interfacing with internal Resource Planning systems. We use the latest official information from Canadian Government sources only. The data undergoes a complete refresh every quarter and undergoes regression testing and quality assurance checks before each release. You can download a sample or check the data with the live online search. The last update was made on the 6th April 2019 . This release was a full quarterly refresh which updated place names, coordinates, and accompanying postcodes. © CanadaCityList.com 2012-2019. Contains information from Statistics Canada and Natural Resources Canada licensed under the Open Government Licence. Request received 2019-04-25 07:57:53 UTC from 3.80.128.196 and served by Digital Ocean.